There are a lot of third party remote control pieces software around such as the popular freeware tools VNC, and TeamViewer, but there are times when the built-in Remote Desktop Connection feature in Windows 7 is the most useful since it’s already present in Windows and you don’t need to install any third party software. All you need to do is to enable it because the Remote Desktop function is disabled by default. You can enable Remote Desktop and allow connection from other computers by going to Control Panel -> System -> Advanced System Settings -> click on the Remote tab. 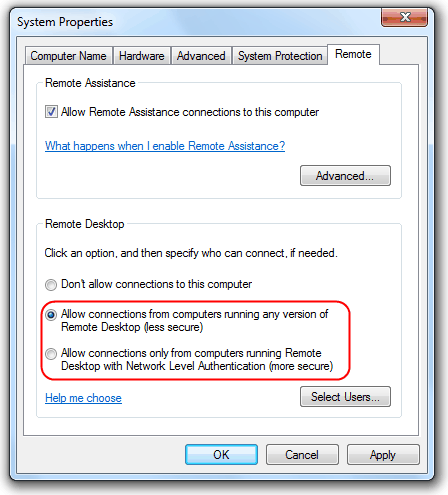 From there, you can either select “Allow connections from computers running any version of Remote Desktop” which is less secure or “Allow connections only from computers running Remote Desktop with Network Level Authentication”. If you are setting up a connection to a different Windows version such as XP or Vista from your Windows 7 machine , then you need to choose the less secure option. Tip: Pressing the WIN Key+ Pause/Break keys simultaneously brings up the System window. If you only see the Remote Assistance box in the Remote tab but not Remote Desktop, that is because there are some restrictions that Microsoft has implemented in your version of Windows. Only Windows 7 Professional, Ultimate and Enterprise can accept connections from Remote Desktop but NOT for Windows 7 Starter, Home Basic and Home Premium. You can however, use Remote Desktop to initiate a connection from any edition of Windows 7. Many branded laptops and computers come with Windows 7 Home Premium or possibly Home Basic pre-installed, but not to worry because there is a hack patch that can enable the Remote Desktop Connection in Windows 7 Home Premium with a single click. Your Remote Desktop session has ended. Another user connected to the remote computer, so your connection was lost. Try connecting again, or contact your network administrator or technical support group. This allows multiple users to control the remote computer using Remote Desktop. Amazingly, this tool also enables the Remote Desktop Connection for Windows 7 Home Premium. The good thing about this patcher is you can revert the changes back to the way it was by clicking the Unpatch button. There are some scripts that can also do the same by patching termsvr.dll file but it doesn’t provide a way to undo the patch. By default, a Remote Desktop Connection only allows you to login with a user account that has a password assigned to it. User accounts with a blank password cannot be used to login with a Remote Desktop Connection. You can handily bypass that restriction by checking the “Enable blank password logons” checkbox. The Concurrent RDP Patcher tool was originally released by a member of The Green Button, which used to be the official Windows Media Center Community forum. Sadly that forum is no longer available. The patcher was updated by its original author a while ago to include compatibility for Windows 7 Service Pack 1. As it was effectively abandoned by the author after this we have since made further updates to the tool as and when needed. It is compatible with both 32bit and 64bit versions of Windows 7. Note that this version of Concurrent RDP Patcher patches the dll on Windows 7 RTM, Service Pack 1 and with update KB3003743 which was released in October 2014. For four years the termsrv.dll file wasn’t changed and the Concurrent RDP Patcher worked fine from October 2014 onwards. Recently though, Microsoft made changes to the dll and it broke the patcher with Rollup update KB4462923 released in October 2018. If you are still running with that update or have not yet installed any Rollup updates beyond January 2019, we have a dedicated Concurrent RDP Patcher that works with it. Unfortunately, it’s only been a few short months and Microsoft has yet again changed the termsrv.dll to break the patcher once more. The offending update is Rollup update KB4486563 released in February 2019. The January 2019 Rollup Preview (KB4480955) also contains the same dll file. We have created a new patcher that should work for this latest update. NOTICE: Please be aware that the Feb 2019 version of the patcher has not been extensively tested so it should be considered as alpha/beta software and could contain bugs. Please use it with care and at your own risk. Of course, we welcome any feedback on how this latest patcher version works for you. 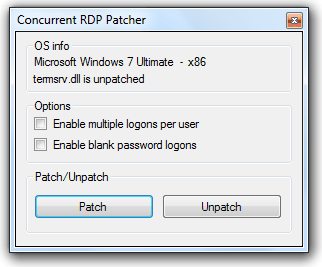 Concurrent RDP Patcher fixed versions work on 32-bit and 64-bit Windows 7 Service Pack 1 and newer. Starter, Home Basic, Home Premium, Professional and Ultimate are supported, but not Enterprise. We will do our best to update the Concurrent RDP Patcher if there are any more updates to the termsrv.dll library in 2019. Support for Windows 7 ends in January 2020 so there aren’t likely to be any more updates after this time. Microsoft has updated the dll for the second time in 2019 and enjoys making life more difficult! Rollup update KB4493472 will break things again. The below patcher is a test version and should be treated as such on 64-bit and 32-bit Windows 7 so please take care when using it. As always, feedback about this version is welcome. April 2019 Test Version works fine on my Windows 7 Home Premium 64-bit. It works with the latest April 2019 Security rollup patch for Windows 7 x64 and x86. You don’t have the April patch KB4493472 installed or there is something wrong with termsrv.dll otherwise it wouldn’t say unknown checksum. The correct unpatched termsrv.dll is version 6.1.7601.24402 and 688,128 bytes in size. Thanks! Works perfect! Just got the april beta and it seems to work just as good as previously. Btw, do the patcher contain all earlier patches, or do I need the older versions for older win7 machines? One patcher doesn’t contain all earlier patches but it supports more than one. Each one supports the default Service Pack 1 dll, the KB3003743 patch from 2014 and whatever latest patch is listed in the article. If you want support for Windows 7 RTM, download the original patcher. Thanks for your work on this. I’m not able to unpack using the password provided. Any help would be greatly appreciated. All the files work with the password provided, don’t forget it’s case sensitive so enter exactly as shown. Thanks, HAL9000! I was thinking the SHA1: was the password but I see on the download page the password is listed. Sorry for the confusion. thanks for your effort but link (to patcher April 2019) is srill the same: 64-bit only. Sorry about that, our CDN hasn’t caught up with the file change yet. I’ve purged the old file manually so the new one should be available now. Just tested! April 2019 Test Version works perfect (Windows 7 32-bit). The April 2019 patcher has been updated with 32-bit support. Thanks HAL9000. This morning I tried 64bit and worked pergectly. Now this new version is asking for a password. Password is noted on the download page. Sorry sir. You are correct. Please, there are still many of us who have Windows 7 32-bit ( there are reasons for that)! sorry Win10 Pro, all updates current. but i don’t see either KB listen in the comments as installed on my machine. Erm, I would have thought it was very obvious that this tool is for Windows 7, it doesn’t work on anything else. crap dude sorry, i have another one that i use for windows 10 and it quit working too, went hunting around on google and this was one of the apps that kept coming up. RDP Wrapper might work for you. Windows 7 x64, April 2019 patch working like a charm once again, thank you so much! It works with KB4493472 x64 April 2019 Security Updates. Thanks HAL9000 for the quick fix! April patch works. Thank you again for keeping this alive. Latest April patcher worked for me with KB4493472 updates. On W7Pro it is showing unknown checksum. Have you tried the April 2019 patcher? That should work with Termsrv.dll 6.1.7601.24402. I came to report it after uninstalling both KBs and getting it back to work. I’ll try it, just downloaded it. I really appreciate your work sir! I’ve added a test version for KB4493472 to the article. Only 64-bit has been updated, 32-bit may be added later but I’m guessing virtually nobody is running 32-bit Windows 7 these days. Patch still works with April 2019 update. Nope it does not – I get error message that termsrv.dll has different checksum. Yeah, April 2019 Security update KB4493472 does break the patcher. Nope, my Win 7 is fully up to date and my status is simply “unpatched”, therefore the dll has not been changed. IF you are running a preview update it might change, but they are not official patches so we don’t count them. I think there were some updates from April that are blocking this. I am also having issues with this. not working for me using the 2019 patcher. Windows 7 Home Premium. Local OS (Windows 7 Professional 64bit) resources (disks and clipboard) aren’t accessible from the remote OS (Windows 7 Home Premium 64bit) during remote desktop session with the latest RDP Patcher 2019. Is it alright, or it is some problem on my remote OS? Hi, I’m running Windows 7 Home Premium and I’ve just downloaded and applied the February 2019 patch – but I still don’t see any options for RDC in the Advanced System Settings (only remote assistance). I’ve tried restarting after the patch (no change). Is there any other step I have to do? Also, thanks for your work on this project! Doesn’t seem right some of us should miss out on such a great tool. HAL9000, excellent job! Is working! We have 5 RDP clients working concurrently after patching Termsrv.dll – 6.1.7601.24326 – 2-Dec-18 – IA-64 on Win 7 Pro. Got upgraded again with KB4489892 (FYI). I’m curious why this works with Windows 7 Starter, Home Basic, Home Premium, Professional and Ultimate, but not Enterprise. Not sure why the original author excluded Enterprise, must have been a valid reason for it though. If you are having trouble with the patcher where it says it cannot access file termsrv.dll because it is being used by another process it may be because you have previously installed the RDP Wrapper. Once you Un-install this you will be able to use this patcher. I was finally able to update all the security patches and use this patcher. It works with the March 2019 security updates. Thanks for confirming it works with the March updates. Yes, obviously if you have something like RDP Wrapper installed it will interfere with the operation of this tool. Is there a solution for Windows 7 Enterprise? Not this tool. It will open on Windows 10 but all the options will be unavailable. Thank you so much for your ongoing maintenance of this patch. Concurrent_RDP_Patcher_2018.exe fixed rdp for me – it stopped working after I updated on 2018-12-29. System is Windows 7 Home. In case it is helpful to anyone else, the updates installed were KB4483187, KB4471987, KB890830 and KB4471318. You should probably warn people that if you use this to allow more than one user to connect to the system, at the same time, you are in violation of the Windows 7 EULA. Useful to remind people of that fact, but I really don’t think anyone is interested in the EULA aspect. If everyone took the Windows EULA literally they’d barely be able to use their computer. And besides, this tool originated from an official Microsoft based Forum, so they didn’t seem to mind at the time. I have two computers I remote into, can’t run more than one user on both. It is a Windows 7 only tool and never has worked on Windows 10, 8 or 8.1. The trojan is identified as Win32/Spursint.F!cl. That would also explain why its not working for some people in the last couple days. Nope, just checked and the files are all clean and identical to the files I have here. If you get this from Windows Defender then it’s just being overzealous with a false positive. Some security applications dislike tools like this because they patch system files and edit registry entries, which is similar to what malware might do. For a bit more peace of mind, I’ve added the SHA1 checksums of the original files. I tried the Feb 2019 patch on W7 Prof French version. When trying to remotly connect, the session start but then stop. If a running session on console, this session is not impacted at all. Find out what the version number of the dll is. As far as I recall, there were no new dlls between October 2014 and October 2018, so you might have the 2014 dll. This is a fantastic tool. I’m very glad to see it being kept up to date as I would have been in a pickle today without it. Works flawlessly here following KB4486565. Thanks, the dll is the same as in KB4486563 so should naturally work, but it’s helpful to have it confirmed. What am I doing wrong? I stopped Remote Desktop Services and still saying cannot access file termsrv.dll because it is being used by another process? Are there other processes that need to be stopped? Thank you very much for updating the tool again! Worked flawlessly for me (KBKB4486563). I have not had to use the latest patch but the previous versions have worked fine. Thanks so much for keeping this alive!!! Yes! Thank you for keeping this up to date! It’s been a life saver. Can I take from this both of you have used the new Feb ’19 patcher and it works OK? I’ve just checked the dll in KB4486565 and it’s identical to the previous dll in KB4486563, so won’t affect anything unless they change it between preview and release. The worst that will happen is you’ll need to re-run the tool to patch the dll again. As discussed above, the Security Update KB4486563 for W7 Pro includes a new termsrv.dll Version 6.1.7601.24236, RDP is affected. Deinstallation of KB4486563 solved the to the state before. Do you have patch for KB4480970 ?? because if we installed this KB, our concurent rdp will not working. as soon as i uninstalled that KB, its worked again. Please we need patch. or this is something not possible anymore? thanks. No, we don’t have an update because everyone else says it’s patch KB4480955 (Jan Preview) that’s causing the problem. If the information to update the patcher becomes available, we will update it. oke i found out that if patch kb4480970 is installed, you can’t login with the windows 10 Microsoft store remote desktop app. Only can login with the android Microsoft remote desktop app. I deleted patch kb4480970 and now i can login again with the win 10 remote desktop app! i don’t have the KB4480955 patch installed, i used the 2018 patcher, i have something strange. On my win 10 laptop i can’t login with the microsoft RD app, it says: perhaps is your password expired or the remote pc doesn’t accept blanco passwords. Hallo, Windows 7 x64 Home Premium (6.1.7601.24326) not working with ‘2018 test version’ anymore – “termsrv.dll has an inknown checksum”. You’ve installed the January Preview patch, just uninstall it for now if you need the RDP functions. When the patch is out of preview and goes live next month I’ll look at the possibility of an update. We really appreciate your help HAL9000! Have a good one everyone! And you are all welcome! PS: Hal9000, any link with the info about what has to be changed and where? I understand is something that has to be done with en hex editor to the file, correct? The tool is, in fact, a mixture of functions. There are hex edits to the dll, registry edits, permissions adjustments, and some other related small edits/fixes. Ok, thanks you for the clarification. I assumed it was just a few bytes on the dll and though of not bothering you again. Zerox you are correct so thank you for that. I just restored from my last system backup and applied all of the latest updates except for KB4480955 and the Concurrent_RDP_Patcher_2018.exe now works correctly. I notice that KB4480955 is optional anyway so I will leave it uninstalled for now. For a list of the files that are provided in this update, download the file information for update 4480955. Did you figure out how to make the RDP Patcher work? Confirming. I just uninstalled KB4480955 and declined future installation for now on this machine. Now my W7Pro termsrv.dll is back to version 6.1.7601.24234 (from 10/18/2018) and 2018 Patcher shows file has been patched. Microsoft released a new termsrv.dll now 6.1.7601.24326 on 12/2/2018 for Windows 7 Pro. Is there someone that know what is that has to changed in the file so we can do it manually and be done with it? Or if HAL9000 has the time to commit a new version that recognizes this new checksum. Any ideas? Thanks in advance if someone can help! HAL9000! Thank you! Your new 2018 patcher works great on my 60+ Windows 7 Pro machines! What an enormous time saver since I can now connect remotely as the admin user and fix things without disturbing the local user! Do you have a tip jar? Thanks again! Are you trying the 2018 test version listed here in the comments? HKLM\SOFTWARE\Microsoft\Windows NT\CurrentVersion\ProductName to Windows 7 Ultimate. I have been trying to get RDP to work for weeks. I have Win 7 Home. I set a password on the target machine (my home laptop). I forwarded the correct router port and used the laptop’s ipv4 address. I downloaded Concurrent RDP Patcher 2018 and selected “Enable multiple logons per user,” then “Patch,” and it successfully patched, showing the message “termsrv.dll is patched.” I found my home computer’s public IP address at whatismyip.com and entered that IP address in Remote Desktop Connection in the “Computer” field on another computer. Every time I’ve tried, no matter what I’ve tried, I get the standard error message on RDC, which says, “Remote Desktop cannot connect to the remote computer for one of these reasons: // 1) Remote access to the server is not enabled // 2) The remote computer is turned off // 3) The remote computer is not available on the network. . . ” etc. What more do I have to do? Thank you. Thank you. It works and really helped me in this critical testing time. It needs updating again. I’m not sure what update did it but had to be a critical update in Sep, Oct, or Nov 2018 because those are the only updates I do. Have you tried the link I posted below?? I did a full update with the latest rollups and the 2018 patcher works. It seems even smart enough to restart RDP service because no reboot required! I only need one extra session so don’t know if it is now capped at 4 as others have reported. However for me it is back to normal. I’m running Windows 7 x64. Just did a bunch of win 7 updates and it killed my RDP. I re-ran the patch, and it *almost* works. I next tried teh new 2018 patch, but no difference. I am able to connect to the machine. On the remote machine I see a blue desktop-type of screen with the win 7 logo at the bottom, and it says “please wait” with a spinning cursor. Then the window size gets smaller for a second, then disappears. Maybe this is a different problem from this patch. Windows 7 Pro, 64bit. Patched in late October/2018. The ‘concurrent rdp patcher 2018’ recognizes the dll. I run it as admin and reboot. But when I go to run it again, it thinks the dll is unpatched. And now I am limited to 4 concurrent users. Previous versions of this patch on the same system allowed more than 4 users, now there is some limit which is imposed. Any ideas of what to try? Sounds like something might be replacing the patched dll on reboot. When I do the same in Pro x64 and reboot, the tool still says the file is patched. The tool checks the MD5 checksum of the patched and unpatched dll. If it is telling you the dll is not patched after restarting, then the MD5 is the unpatched checksum and the file has reverted to the original. That could be caused by security settings or software. Since recent Windows 7 Update, this version (Concurrent_RDP_Patcher_KB3003743_Fix) reports that termsrv.dll has an unknown checksum and will not patch. Is there a newer version of the RDP Patcher? iIf so, where? 07/11/2018 update. Applied all updates and run as admin your Concurrent_RDP_Patcher_KB3003743_Fix.zip – rebooted my pc, and works fine. Win7 pro x64 bit..
“This termsrv.dll is in use by another processor and can not be accessed by the process”. I’m sorry, we are unable to test non-English versions. I have been using “Concurrent RDP” patches with all Windows operating systems since it was first released for Windows XP. Ever since there has been Windows updates that fixes the patch, so the concurrent RDP stops working. Once again I’m experiencing this issue. I’m running Win 7 Pro 64 and with some of the latest Windows update the RDP stopped working. I tried everything, but this time I can not figure out, what is the matter. RDP Service is working and it accepts connections. However, every time when I try to remotely connect this computer, the RDP client is able to establish the connection. However, it will disconnect immediately without any warning, or message etc. I can see quick flash of my desktop. When I logon this computer localy, I can see from taskmanager, that there is no other users logged on. So the logon fails. What can be the issue? Are you using the recent update to the RDP tool? I tried t0 use them all. This _2018 version claims the checksum of the termrv.dll is invalid. I tried to restore the original .dll from the installation media. However, the result is the same, Is there any place to download prepatched termsrv.dll? The latest update to the tool will work with the Windows update mentioned, as you can see from others commenting it works on the latest dll as intended. If the checksum fails you have the wrong or an incompatible dll. The tool will now not recognize the original RTM dll because I replaced that patch with this one (by now nobody should be using it). Which version and architecture of Windows are you using? Is it an original install media or some custom install? Thank you for answer. I found this. Full path to Limit number of connection: Computer Configuration\Policies\Administrative Templates\Windows Components\Remote Desktop Services\Remote Desktop Session Host\Connections. If in default setting, GPO allows me to connect max 5 users, why i have this problem with 2 connected users ? Thank you sooo much for the update! HAL9000 thank you. Yes all worked like a charm. Love your work. 3 users : Admin, X1, X2. Good morning, I’m Portuguese and although I do not understand your words well, I think your problem is solved by: menu starts, executes, writes gpedit.msc and presses ENTER, locates / searches for maxconcurrenteusers, by default this is not configured (only allows 5 users), then change the dot [.] to enabled and in the box below write the number you need. You may have to re-start your pc. Excellent work sir! It is working on W7 Pro Build 7601. Dude you freaking rock – thanks bunches! Ditto, kb4462923 broke RDP, uninstalled it and now RDP works again. Win 7 home premium. Please fix the patch we did not have unfortuna telly restore points and can not revert the changes. Now we are sitting duck and can not work. Please let us know it you are fixed it. Thank you sir. Ran into the same problem and backing out kb4462923 worked for me. Hoping someone will come up with a revised patch for this so further updates can be allowed. I rolled back kb4462923 (2018-10 Security Monthly Rollup for Windows 7 x64) and it worked again. Because there is an updated termsrv.dll in the monthly roll ups all further rollups need to stop until the patcher is updated. We just got the latest windows update that happened yesterday and the Concurrent RDP patcher is now working now. Is this affecting anyone else or just me? An update around Sept 2018 broke this again sadly, been an avid user. hope it gets patched again! If that’s the case and I could find what needs to be patched, I would update the tool. Yes, confirm. Today we lost it after windows update KB4458611, KB4457139, KB915597 if is of any help. I haven’t check each one but only one should be the infringer. I just got it back to work after uninstalling kb4457139. Thanks for your work on this sir! Hey @zerox which version windows do you have? For me it was KB4462923 that causes the RDP problem. (on a Windows 7 Family Premium). Any update on the patcher? I cant even find where to patch the dll in a hex editor. No news, like you, I have no information about what needs to be patched in the latest dll. Thanks, it’s not the files I need to know about, I need to know what bytes have to be patched in the termsrv.dll file. Last time this happened in 2014 I was lucky enough to find out online what bytes needed to be patched, so could update the program. If similar information can’t be found for the latest dll, the tool can’t be updated. I tried the hex numbers SM Patcher posted (somehow couldn’t reply to his post) on termserv.dll with this version number and it seems to work fine. Could log in with two users remotely and one user locally (being member of the Remote Desktop Users group). This didn’t work with before. Thanks to SM Patcher for making my life easier! Kaspersky endpoint security seems to block this. Any idea how to allow in the rules of the firewall for concurrent connections? It works fine without Kaspersky enabled. thanks! It worked for me for years, using xfreerdp (package freerdp) from Linux to Windows Home. i have downloaded and used the patch, but how do i get the remote desktop to come up so i can connect to my remote pc? you run the patch on the remote pc not on the one that you’re using. it is working !!! great! Doesn’t work with Windows 7 Ultimate SP1 x64 build 7601 PL. Of course, just because Windows Ultimate already has remote desktop support already enabled!!!! Hi yesterday I have done fresh installation Windows 7 home premium SP1 and fully updated and the patch not is working for me. I tried patch-unpatch a lot of times but remote desktop open and looks is goingo to work but close ver fast without errors. Latest version works great on updated Windows 7 Professional! Make sure you are using the version on the very bottom of the post! It works for Window 7 Pro SP1. Thank you! MAN! GOD BLESS. IT WORKED! ****** YOU GOT NO IDea how much stress I had. In the freaking middle of the night. Still 2hours to make this freaking server with 25 employees work. Stressed out. 2 hours left as they will start to work, since I’m on a different time zone. The entire company would be on production hold. I’m talking about manufacture in a huge scale. What could I do??! Found this site…….and it worked. POEF!!!!!!!!! Man If I ever knew who had this solution patch? I would personally send them a beer!! It’s a little weird to actually LOGIN to the computer, and not just ‘drive’ the computer remotely. Worked fine on my Win 7 Home Premium 64bit SP1 which is running as a virtual PC on Win 10 Hyper-V. I used the later “fixed” version of the Patcher as my install already had KB3003743 update applied. Worked perfectly first time. I am running Windows 7 Home Premium. Using information posted with the original patch (Concurrent RDP Patcher_2-22-2011) I uninstalled Patch KB2984972 and then tried patching, but the patch said “unknown checksum”. I Then found this post and I see that I do have KB3003743 installed (termsrv.dll is version 18637). I ran this patch Concurrent_RDP_Patcher_KB3003743_Fix.zip. The Patcher says “termsrv.dll is patched”. However System_Properties–Remote still only shows Allow Remote Assistance (and I can’t connect from another system).. I’ve rebooted multiple times and tried uppatch/repatch but no luck. Home Premium is not capable of RDP out of the box – that is why it is not working. Look for another application called ‘RDPWrap’. That will finish it up for you. Says that termsrv.dll is patched but I still only see Allow Remote Assistance. There is new versions of the RPD-Patcher?? Yes, as the article states, this is not for Enterprise. Downloaded this today and can confirm that it is still working on windows 7 professional. Double click to run and enabled multiple logins per user, clicked patch and it kicked me off while it replaced the file. Waited 2 minutes then hopped back in and tested multiple concurrent sessions. As BrankoH said, any chance the desktops can mirror one another? I find it disconcerting that I’m remoted onto the W7HP machine and what I do from my Windows 10 RDP screen doesn’t reflect on the W7 screen itself. Shouldn’t everything reflect, just as if I were on with Teamviewer, etc.? I can connect and fully remote in from my android tablet but only to the main user. I have a total of three users and when i try to remote into to ano other users it just keeps re-asking me for the password as if I had typed in the wrong passwords. I’m starting to think that it only works with one users. I tried to make two users to be administrators with passwords and it still only allows remoting to the first user that was originally the administrator. I have 64 bit windows 7 Premium and the android table uses the app called “Microsoft Remote Desktop”. It works super good but only for one user in the desktop. hi can you tell me how the patching process work ? Awesome solution…..after toiling the internet the whole day…….FINALLY !!!! Thanks man, used this today! I got it working! Thanks! But can I make the screens mirror each other? Says that Windows 7 Enterprise is not supported. The patcher program is showing everything grayed out. I ran it on a different Windows 7 Professional machine and it worked fine. That’s right Pro is supported, Enterprise is not supported. Will this work on Windows 7 Pro and Windows 10 Pro versions? What would happen if Microsoft decides to patch the file again. Will it cause system instability? Should we backup the original termsrv file first before installing? Where is the file located? If Microsoft patches termsrv.dll again it will simply overwrite the patched dll and will work like it did before patching. If that happens we would need to update the tool again to patch the newer dll. Thanks HAL9000. If it does happen, is there place where we can download the newer patcher or do we just go back to this site? I’m still looking for a resolution for this. I’ve been looking for the past 2 days and still having no joy. I’m trying to connect to a Windows 7 Home Premium from a Mac. Is there still not way to accomplish this without using a third party application? Would I need to upgrade to a newer version of windows? I like Windows 7 though. Forgot to mention, I’m trying to connect over the internet, outside the network. I’ve setup port forwarding on the router. I cannot see remote desktop options in system preferences. I downloaded and it ran it and all I got was an IMMEDIATE show-stopping error. “termsrv.dll has an unknown checksum”. Can you see what you think? i have windows 7 home premium. That’s simply because you don’t have the correct termsrv.dll that the program is looking for. Download the updated version and make sure you have update patch KB3003743 installed. Hello there, thanks for the article, but i have a question, does this patch enables multimonitor on host? I ask that because my host has win7 pro, and by default that OS version does not support multimonitor. installing this patch does not work, even the patched version. I still do not see Remote Desktop options, only Remote Assistance. I’ve Googled this to see if anyone else has the same issue and can’t find anything. What gives? I installed the patch on both my computer and the one I want to remote into. Both are running Win 7 Home Premium. When I attempt to connect, it pops up the user and password input. For some reason, it keeps telling me that it’s the wrong password. I know it is the correct username and password. Any thoughts? You need to make sure the local user account (for the machine you want to connect to) is a member of the remote users group. Go to Start, type “mmc.” This is the microsoft management console. Click on file > Add snap-in, and double click on Local Users and Groups. Click on Users, then find your account. The login name should be the first thing listed on the left. Then, go back, go to groups, and go to Remote Users group. Add your login account there if it is not already present. Unfortunately, that snap-in is not allowed on a computer running home premium. Any other thoughts? After trying literally everything, I found a solution. There was a discrepancy between the login name and the account name on the profile in Win7HP. Normally, the login name is used for everything. Under the hood, the default account name was “Dell” and not the login name. Once corrected, I logged in without any issue. Hope this helps! A recent Windows update seems to have broken rdp. (April 12,2016). Anyone else have this problem and knows which one? What happens when you run the RDP patcher? I’ve just checked after installing the latest updates and my Termsrv.dll is still from 2014, version 18637. Get the message ‘Termsrv.dll has an unknown checksum and all the options are greyed out. Found the problem. KB 3003743 got installed again somehow. Well, uninstalling the KB 3003743 didn’t solve the problem. When I run RDP it still says unknown checksum with all the options greyed out. ???? The RDP Patcher patches Termsrv.dll version 18637 so you will need to reinstall KB3003743. Thanks very much. Reinstalled 3003743 and ran the patch – worked just fine. Thanks again for your help! Everything is cool, thank you! One more thing you need to do if you use Windows Firewall on your windows 7 home edition machine. You need to create a new inbound rule to allow port 3389. Otherwise you’ll have to turn off the firewall every time you want to connect. I want to remote desktop over the internet but it wont work. I checked to see if the port was open at canyouseeme.org and it was. do you know why I cant access my computer over the internet. it works fine on the local network tho. Thank you for this. Works like a charm on my windows 7 home premium. I have a quick question. How can I login to a same RDP session if I left it with unfinished work. For example if I login with user X and worked on a word document. Can u close the RDP session without logging out and then log back into the same session so I can continue my work? Also on the desktop where I installed the patch, if I have my main user logged in with multiple programs running with my current work opened. If I want to remote into that users desktop and preserve the work so I can continue remotely, what’s the best way to do that? Right now when I log in with the same user, it creates a new session and hence does not take me to the current working window. Thank you again for this tool. Win7 Home Premium, patched to the latest updates. Any ideas? Or any logs I can check? Windows 7 Home Basic is supported, are you using any special version other than standard? Worked a treat! Thanks guys. Tried the patched version with Windows 7 Starter that has KB3003743 installed. OS Info window says “Microsoft Windows 7 Starter – Unsupported termsrv.dll is unpatched” Thought I might be able to get remote desktop working with Win 7 Starter. Any ideas? The patcher does not work with the Starter Edition because it has some networking and RDP restrictions. No, command line parameters are not possible. I just found a great RDP patch that works with any version of windows. Please let me know when a Windows 10 Home patch is available. Upgraded to windows 10 home and the patch stopped working.. Any fix for this please ? The patcher is for Windows 7 only, has never worked on Windows 8/8.1 and won’t work for 10. Therfore I also think that windows 10 will be the same thing. Are we talking about the same thing? Concurrent RDP Patcher does not work on Windows 8/8.1 or 10 because it checks to see what version of Windows 7 you have before starting and won’t work without a compatible version, the termsrv.dll is also different in those operating systems and won’t be patched. I hope they update this for Windows 10 Home. My computer is telling me that I will get the free upgrade to Windows 10. However, this will be Windows 10 Home, which is not likely to include Remote Desktop. Does anyone know a way of making this work? please help me., i was able to install and make the RDP run ( after the so called checksum error) – termsvr.dll now patched. but when i tried to access remotely, it quickly terminates after the logon. (after entering the user credential). I turned off the firewall already, and uninstall antivirus too.. Worked perfectly first go. Thank you. Thanks for this you are a star – it worked like a charm on Windows 7 Professional! Worked like a charm. Easy fix. Thanks for taking the time to fix this patch. Awesome! Thanks for taking your time to update this tool. After installing your updated version on my RDP host, I can get to the screen where I enter the user name and password from my RDP client but nothing happens after that. I’m wondering if this might have to do with using Windows 7 Home Premium ‘K’ version (K for Korean). It would help tremendously to get this to work so I can do part of my work at home. If the patching process just involves changing some of the codes in Termsvc can you please show which codes I need to replace? Unfortunately we are unable to test the patcher or make edits for any language version other than English. First of all, I’d appreciate your patch. it accept username and password, but then it never show any messages, no response… just as like blocked by something. Could you please let me know what is problem? Thank you in advance. Here the same issue. With the latest Windows update the patch doesn’ t work anymore. You can add the username and password, but nothings happening. Beside, the RDP option isn’t available anymore, only the remote support option. Keep up the good work!! Thank you for keeping this up to date. Some of the other versions of this have since stopped working, but after pulling the troublesome updates, your updated version does the job. I am having a problem with changing the ports, though. I’ve changed the port in the Registry, changed the forwarded port, and entered the connection in the [IP Address]:[Port] method, as well as restarting the services (and even the PCs themselves). For whatever reason, I can’t connect even with all the proper port changes. This used to be possible with the now defunct MissingRemote version, but it doesn’t seem to take on this version. If you have any thoughts on the matter, it’d be much appreciated. Thanks again for keeping this up! Well, I hate to reply to myself so foolishly, but the problem was so simple I’m ashamed of myself… Firewall ports had to be updated. Quick Heal tests this positive for CryptoLocker… YIKES. I’m too careful to think about installing this if it might have something like that in it. You’ll note both detections there have “gen” or “generic” in the result, that means they are making a guess at detecting it’s malicious, and getting it wrong. You are of course free to not use the program if you are in any way unsure about its safety. Hi. Tested with windows 7 family premium and both version of the patch. I don’t have access to RD options in system properties/remote even after patching. I may be doing something wrong, but it seems that it does not work. Now it accepts the username, asks for password, but the remote desktop never loads. It just terminates with no message. Thanks a lot. Works great! Save my day! I did it remotely. Via RDP, of course. :-) I was disconnected for obvious reasons, so I reconnected. No problems. I’ve noticed however, that termsrv.dll modification date was changed to 2015-04-04 03:35. Your files are not accessable anymore. Can you please redistribute them? Let me know if you need a tester or some data from Windows 7 Professional N registry. Would you please recompile the patcher to accept Windows 7 Professional N that is stripped down (no Media Player, Windows Meaaadia Center and Windows DVD Maker) version on Windows 7 Professional? Thanks. Thanks for writing this up, it’s working for me in Windows 7 Home Premium SP1. I have a question though about the resolution of the remote desktop, when I connect remotely the resolution of the Remote Desktop window is only 1024×768.How can I increase that? In the remote desktop session, in Control Panel > Display > Screen Resolution, the Display is shown as: 1. (Default Monitor) on RDPDD Chained DD. Resolution: 1024 x 768. Both are greyed out and not changeable. At the top of that window is a yellow box with the message: The display setting can’t be changed from a remote session. The system I’m accessing actually has a 1280×1024 LCD attached, so it appears that 1024 x 768 is hard coded somewhere as the resolution to use for remote sessions? Does anyone know how I can increase that resolution? BTW, I’m using CoRD on OSX as the RD client. AVG says the files have trojan and removes to vault, is it intentional? It’s a false positive, most likely because the program patches a system file (termsrv.dll). Concurrent RDP Patcher is working again (Win7 Home Premium SP1 64bit)!! Thank you very much, Your patch worked. I Have a laptop with fully patched Genuine Win7 Home premium 64bit SP1 with the KB3003743 installed. Your modified patch worked. Have run patch on my genuine Win7 Home Premium x64 SP1 without problems. It now says patched. However, any RDP connection (local or remote) starts, asks for username+password, then brings up the remote desktop for ~2 seconds and then TERMINATES immediately (closes remote desktop window). Only help seems to be to uninstall KB3003743 update. Is it possible the patch only works on cracked Win7 and fails on genuine ones? I have tried also the “RDP Wrapper”, same results – works only with KB… update uninstalled. It took me 2 hours, before I realize, that my issue is WIN7 Home Pro edition. Thanks heaps for your help! WINDOWS 7 Home Premium 64 – bit. Tried installing 3003743 and was able to click patch. Went back to system to enable remote desktop and the option to enable still didn’t come up. I just opened the extracted files from my downloads folder. I’m trying to connect using the ipad app Microsoft Remote Desktop. I didn’t see any directions to do anything differently but just double checking. Thanks! I downloaded your test file. When i Run it as administrator. It says termsrv.dll has an unknown checksum. and it don’t give me the option to check any boxes. what does this mean? It means either you don’t have patch 3003743 installed, the termsrv.dll has been modified from it’s default in some way, or you are trying to run it on an unsupported OS, like Win 7 Enterprise. Is there any command line options so that patcher may be used from command line in “silent” mode, so tp patch system in case it may do it? Is there any source code available? It should be easy to add command line options. Update: Despite the error message about the process being in use by another user, the patch seems to have worked. I’ve been able to connect concurrent sessions. I used “run as administrator” by the way, when running the patch. Thanks for your work on this. I’m having a pretty basic problem. When I run the patcher, it verifies the termsrv.dll is unpatched. When I tell it to Patch, it gives me an error that the file is being used by another process. What’s the proper way around it? I’m running Win 7.1 Pro x64, if that matters. Thank you! If you have tried the test file (files.raymond.cc/Concurrent RDP Patcher_test.zip) and you are having the problem, either you don’t have patch 3003743 installed or something else has altered the termsrv.dll file. The patcher needs a completely unmodified dll to work. Ok, and if it’s the case? Uninstall patch 3003743 from Windows update. The RDP tool will definitely recognise a non modified termsrv.dll and patch it. What is the maximum number of concurrent connections? Has anyone tried 8 or more concurrent connections? Thank you. First of all thank you for your effort! I’m having some troubles whit the patch. version KB3003743 of the fix does not allow me to patch the dll file but the KB2984972 version does it. The problem is ,in spite of patching correctly the library, remote desktop option does not appears on the menu. I’ve tried rebooting but still missing. Now I’m using W7 home premium. Let’s hope you can help me to make the patch work! It includes a few fixes for 32-bit. You are a life savior.. updating the patcher is very much appreciated. Thank you. AWESOME JOB AND KEEP UP THE GOOD WORK. IT TOOK ME A WHILE TO FIND THIS SITE BACK AND IM GLAD I DID. Works great in Windows 7 Professional 64 bits updated in 28/01/2015. win7 home premium 64bit with all updates this patcher works fine and enable rdp to this device. Works great in Windows 7 Home Premium 64 bits updated in 14/01/2015. I had downloaded the pacth in november and Remote Desktop connections were working fine. It still did not work! What is the solution? is there a newer patch? There are two versions of our modified patcher, the version in the post for the latest patch and the version you link to is for the previous patch. You need to check which patches you have installed to work out which program you need to run. Try RDP Wrapper instead of Patcher. It does not get borken by the Windows updates. First of all, Thanks for your help. I download this patcher and run this file. but OS info show termsrv.dll has an unknown checksum. Remember it only works on Win 7 non Enterprise and the termsrv.dll has to be untouched. Hi, same problem. The latest KB3003743_Fix.zip shows termsrv.ddl is pathed, but I cannot connect. It has been working until November 2015. Which version of Windows are you using? I’ve found some more code that might help fix problems on 32-bit but 64-bit is the latest patch code I can find. I have got Windows home premium 32 bit, and the patch KB3003743_Fix.zip shows termsrv.ddl is pathed, but I cannot connect. Any idea what can help? Ok, as I said earlier I’ve found some updated code for 32 bit so I will add that in the next few hours for you and others to try out. Thank you for this. BIG help. Running well on W7 Home Premium x64 with all of Winblows latest updates for about a week now. Only issue we found is that the clipboard doesn’t share across machines (as it does with native RDP sessions) despite how the RDP options panel is configured for the RDP_Patcher session. Good catch … definitely could use a solution for that. you saved my life, thank you! I have a partner who has a Home Premium in her pc and some days the remote desktop did not work … the last update could help, remote desktop is working fine again, thank you very much! Great work, thanks a bunch! Last Patch Tuesday’s update killed it though. Not sure which update it was, but I got it working again with the patches below. Maybe you can include them in the next version? It was done a week ago, I’ve added it to the article so everyone can see it better. Unpatched termsrv from before, installed KB3003743, used the new fixed patcher, patched and it doesn’t work. (i.e. it’s that same issue with connecting->configuring->etc and it looks like it connects, but then you get no window with the actual RDP session). W7 SP1 x86 all patches installed. Yes, it works perfectly on 2 different W7 Home installations. MANY Thanks for this great job! Thank you again — Working Win7 Pro 64 VM. Updated the link as a few people were having trouble downloading. Yes, the same for me. W7 Home could be patched on 2 PC’s. But since last MS-update not working again. I removed the installation of update KB3003743 on one machine, and on the other I excluded it form the update process (see the update details and uncheck the box) and in both cases, worked perfectly afterwards. A new patch came out today 11/12 for Windows 7 that broke the new Concurrent TDP patch again. termsrv.dll has an unknown checksum again. Worked great for years. Today’s (11-11-14) windows 7 update killed it. Anyone know what to do to fix it? They’ve updated it yet again?? Unbelievable! Yes in deed. Your update worked for a few weeks perfectly on 2 W7 Home systems. Hopefully you can again fix the problem, good luck and MANY thanks!!! After the 11-14 update uninstall update KB2984972. Personally I am not to concerned about security implications as my machines are on a secure internal network. One will need to hide the update in the Windows Update app otherwise it will be reinstalled. Obviously a proper solution would be an update to the wonderful Concurrent RDP Patcher tool … Thank you too Raymondcc for providing the tool. thank you for the updated version! working on my updated Win7 pro VM. Thanks for the report, hopefully we’ll get some more positive responses so it can be included in the article as a proper updated version to the original patcher. This new patcher does not work for me on Windows 7 Enterprise SP1 x64. It appears Enterprise in unsupported. The original patcher doesn’t support Enterprise either, it never has. It works for me on a Win7 Pro 64 . Works perfectly on both the Win & Home Premium machines that i needed this facility on…. MS REALLY needed to make the lack of this facility a little more obvious. It was assumed on the original purchase of the O/S that it would be there!! It appears that M$ has been at it again and KB2973501 updates termsrv.dll to version 6.2.9200.17048. Uninstalling that update got Multi-User UDP working again for me. Is there an update to the RDP Patcher to resolve this? The RDP Patcher was never designed to work with Windows 8/8.1/2012, which is what update KB2973501 is made for. So….has the patcher software been updated to cope with update KB2984972 ? I found a different solution on another forum, but it does not preserve the CONCURRENT capability. Any chance that someone can modify the 2/22/2011 version of this software to cope with current issues? Thanks! This has been reliable for several years but just stopped working on a windows home premium machine. Anyone else having the same issue (perhaps the last windows update)? The connection neither connects nor errors out, appears to connect then nothing..
Oh forgot to add when Concurrent RDP Patcher is run, it is grayed out and a check-sum error is present at top OS Info box. You’ll have to copy and paste that link because I’m not sure what the rules are for pasting links here. The latest updates for Windows 7 seem to have replaced termsrv.dll. Can someone update the patcher as well? Uninstalling KB2984972 is a temporary solution. I’m hoping there is a solution soon, so I don’t have to keep KB2984972 patch from installing. It certainly is the cause of the failure of the terminal server patch, but I would like a longer term solution. I have this problem that the remote will not start a program when connected. I must be doing something wrong can you help please. Did you ever know that you’re my hero? and everything I would like to be? 2. You can not work remotely as an ordinary user. You have to be an administrator. There is no interface to assign Remote Desktop access rights to users, and administrators have this access by default. Never been a big fan of using VPN software, and Don’t want to muck around with upgrading the OS on an OEM laptop. There always seems to be some problem with some software when you go this route. I can not thank you enough for the folks that made this tool. THANK YOU! THANK YOU! THANK YOU! THANK YOU! THANK YOU! THANK YOU! THANK YOU! THANK YOU! THANK YOU! THANK YOU! THANK YOU! THANK YOU! RDP may not be the end all of how to remote in, but it is the best way to do it sometimes. And for me, I just don’t want to get up and mess with the laptop that is right next to me. Thanks to this software, I can put on movies for my kid, or Music for him to go to bed to all from the comfort of my chair. This just made windows 7 just that much better. As a user of 8, I have to say, there are just some things that Windows 8 just can’t do. Well, at least not without tons of help. Again, You really just made my day. And my sons too! Thank you. no where did a message say my version wasnt capable. that makes me mad. but this works awesome. I met a problem of “asking of credential” input windows. I have ran the patcher in the host computer, then, it installed successfully. Then, I ran the Remote Desktop Connection in client computer, input the ip addresses, click connect, but a “windows security” dialogue prompted out asking for password. So, there is no password set on the host computer. May I know how to disable the feature of asking credential from the client computer in order to connect the host computer? RDP wont work without passwords on the login account! Checked box for multiple logons and blank passwords. Ran patch. Window says “- x64 termsrv.dll is patched”. W7 remote settings page does not show “Remote Desktop” in bottom of page. I am currently running W7 SP1. Hi, I’ve come across this post & tried the above & it partially works! Hoping someone could please shed some light into why it won’t work completely. Much appreciated in advance. Firstly, I’m using the RD Client on my iPad 2. The computer I’m remotely controlling runs 7 Home Prem & has wireless internet connection. When I access thru my iPad 2 on the same wireless connection (at home in another room) it works perfectly – I’m able to remotely access the computer, however, when I’m on another wireless connection (away from home) than I can’t login at all. Hope that makes sense as I can’t see why it doesn’t work! Malware Bytes just picked this up as a trojan.agent.. Is this a false positive or have I exposed my machine..
Don’t worry it’s a false positive, this is because the program patches a system file and some security software flags it as malicious. If you go to the Green Button community above which is an official Microsoft site, you’ll get the same result…. This worked GREAT for me! I was NOT looking forward to putting any more money into M$ pockets to upgrade Windows 7 to Pro, just to enable this one feature. Learning Linux so one day can get away from M$ completely.. in the meantime though this really helped. This is good only in static ip address not in dhcp like in my country almost ISP here provides dhcp services and it was very difficult to open their ports to access other computers over internet… so I used teamviewer for remote desktop support… this is awesome software i like it very much…. it works even the port of your router is closed….. Anonymous. If you utilise a Dynamic DNS agent, like noip.com, then you can connect to remote desktop, even if your internet connection has a dynamic IP. Don’t forget to set up obscurity on your router by utilising an alternative port to the default 3389 for RDP. I have been using the concurrent patch for some time now in my HTPC. That way people can be watching a movie while I can do my own stuff remotely. Really Windows 7 should allow multiple sessions by default. now i can try remote desktop my home system from same network with current user logged in. Wow cool as usual from you ;). Thank you :D. O before use think ethically :P.
You save me and my time.